I wonder how many pints of ale have been supped here? Let me see: if just twenty people drank a modest 4 pints every night, that would be, er, 29,200 pints a year – 2,920,000 for every century. But the revenue generated by that amount of beer would not be enough to make the place viable. 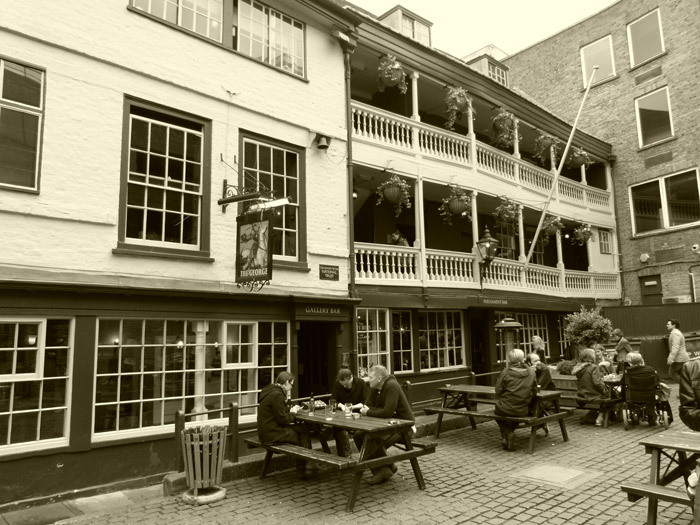 So given that there has been an inn on the present site of the George Inn since medieval times, the mind boggles at how much alcohol and food has been consumed within its precincts over the centuries. You can play this game at hundreds of pubs throughout Britain of course. 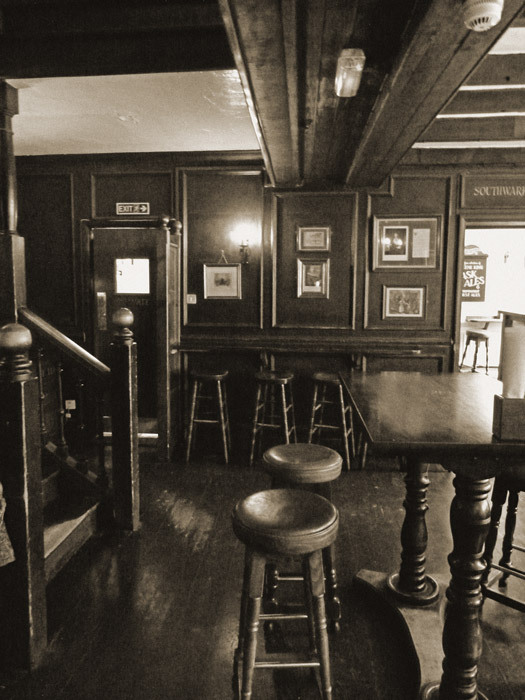 Unlike several, the George does not claim to be the oldest pub in the land, but it is the only surviving galleried coaching inn to be found in London and therefore deserves a little respect. You’ll find it in Southwark, tucked away off Borough High Street and just a few minutes from London Bridge station. During the reign of Henry VIII it was called the St George – I idly wonder if this was anything to do with the parish of St George the Martyr nearby – and was probably known to, if not frequented by, William Shakespeare. 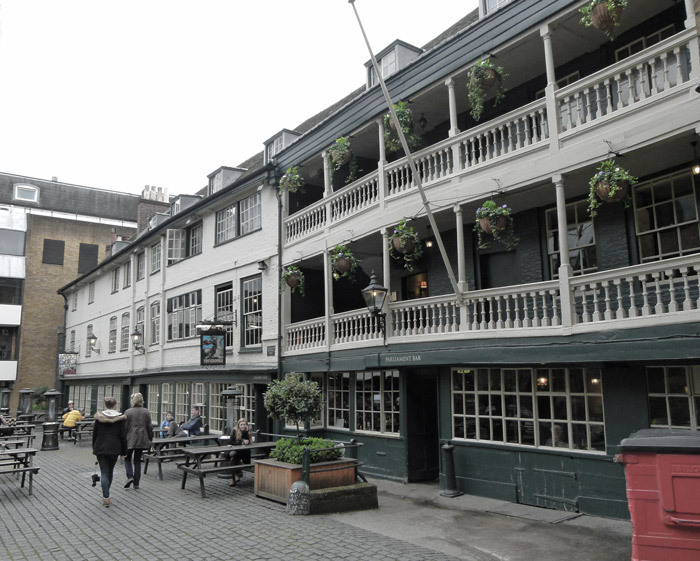 The inn was badly damaged by fire in 1669 and then destroyed in the great fire that engulfed much of this part of Southwark in 1676. It was rebuilt, apparently on the same footprint, in 1677. Coaching inns of yesteryear provided so much more than merely food and drink for the weary traveller and, at one time, the George must have been huge, a building occupying three sides of a long galleried rectangle with a central courtyard where plays were performed and a gated frontage off the High Street. Southwark was once well-stocked with inns and hostelries of all sorts. Until 1729, London Bridge was the only bridge across the Thames east of Kingston. Travellers from the south up the old Roman Stane and Watling Streets converged in Southwark, and if they arrived at nightfall after curfew they needed somewhere to stay before entering London the following day. Merchants heading south would cross London Bridge before curfew, to avoid morning rush-hour, sleep over in Southwark and make an early start. Who intended to ride to Canterbury. And were well accommodated in the best way. To make our way, as I will tell you. The Tabard was renamed the Talbot and was demolished in 1873. Talbot Yard is next to the George Inn. Many of the inns that once lined Borough High Street were rendered redundant by the arrival of the railway. Indeed, the Great Northern Railway Company demolished the north and east wings of the George in 1889, to make way for warehouses. Now, what remains of the place is safe in the ownership of the National Trust, who lease it out. 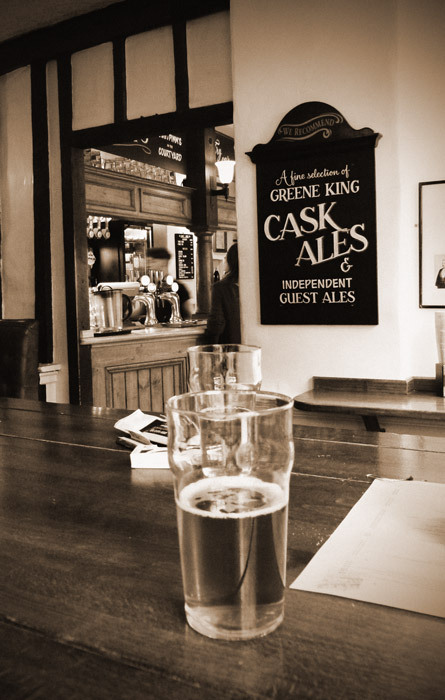 At my last visit it served a rather pleasant Abbot Ale – I’m quite partial to Greene King – and there wasn’t a TV or slot machine in sight; perfect! So, tarry awhile amongst the wood panelling in this surviving relic of London’s past and contemplate all who have supped before you. Dickens certainly did – he mentions the George in Little Dorrit. I have discovered there’s a book about The George at Borough – “Shakespeare’s Local: Six Centuries of History Seen Through One Extraordinary Pub” – looks like it could be a fascinating read, if you can find a copy. It’s by Pete Brown. Go to A Bit About Britain’s directory listing for the George at Borough. My favorite words in this wonderful post — “There wasn’t a TV or slot machine in sight.” Thank you, George Inn! Ah, yes, the George. Had a glass of something tasty there last time I was in London. A bucket list sort of place. One I can say I have crossed off. If in London, a must do.